Rotary kilns (furnaces) of indirect heating are used for drying different friable materials as well as heating them up to temperatures required for different technological processes. In rotary kilns of indirect heating processes of heat production take place outside the case of the rotating furnace. So, the processed material does not come into contact with combustion gases which can be important for the product quality. Operation of the kiln is allowed within the range of temperatures of the case side from - 20°С to + 400°С. Another advantage is that the quantity of gases emitted from the kiln which should go through the dust control system is rather small. This allows to effectively process products which emit much dust with particles of small size. Depending on the used material of the cylinder and charging-discharging chambers, the plant can produce kilns of the following options: made from steel 09G2S and from acid-fast heat-resistant steel 12H18N10Т. 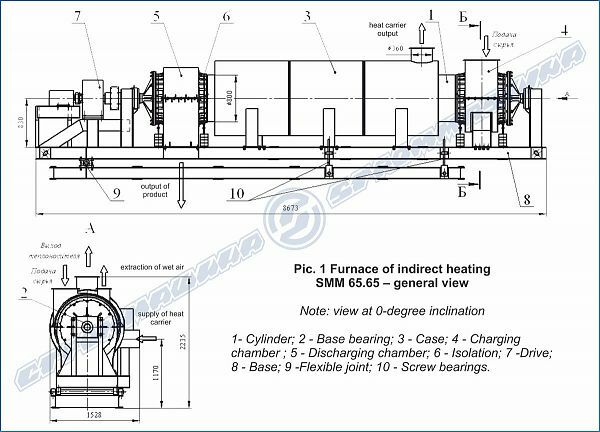 The rotary kiln of indirect heating is a cylinder rotating on bearing rims mounted on the frame and covered by a fixed case where hot gases are pumped during the kiln operation. These gases heat up the outer surface of the rotary cylinder when touching it and provide transmission of heat to the processed material without any direct contact with it. The outer case is insulated which allows to minimize energy loss. Inclination of the case together with rotation round the axis provides the move of the processed material in the direction of the discharge chamber. Drying modes for different materials are selected depending on the dried material, climate conditions, season, weather. When the water content of the product or the intensity of its supply to the cylinder changes, the drying mode can be controlled by the quantity of ingoing gases and the change of their temperature. The cylinder of the kiln is moved to rotation by the drive consisting of the electric engine with frequency control. The cylinder and the case of the kiln (furnace), charging and discharging chambers of the drive device are mounted on the base consisting of a frame and a subframe connected by a flexible joint and screw bearings due to which the angle of the frame inclination can be changed within 0°…5°. *Up on the customer’s request, it is possible to produce a rotary kiln of indirect heating with the diameter greater than 1.6 m.